Space Orphans are indeed playing themselves some SHOWS! Coming up they hit BAR on Wednesday, January 2 with Math The Band! Free Music at BAR EVERY Wednesday night in the back room! Math the Band is a electro-punk spazz duo from Providence, RI. They use a combination of old video game systems, analog synthesizers and energy drinks to make the fastest, loudest, most party-est music they can imagine. They've only cracked their head open on stage ONCE. search for the right line-up, they recruited Kelly L’Heureux (Atrina, MT Bearington) on Bass and Frank Malec on Keyboards. 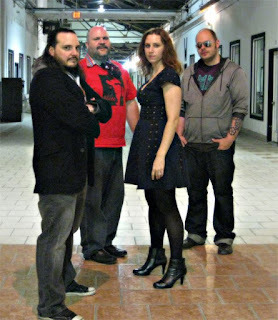 Both Kelly and Frank are featured on several studio tracks from Kimono Draggin’s discography, so they are no strangers to the disjointed quirkiness of Joe and Chris’ music styles. Built upon a thick foundation of scratchy guitars, weighty drums, relentlessly shifting rhythms and rowdy animated vocals, Space Orphans are determined to evolve the sound. The new arrangement adds a blanket layer of cosmic essence, worthy of their name, while the musical structures are more focused, finely tuned and surprisingly melodic. If cornered into describing them under an umbrella genre, one might say they are a mixture of Shoegaze, Glam and Prog...but you really need to hear them for yourself in order to wrap your head around it.